We arrived at downtown Baraboo, WI after visiting the International Crane Sanctuary, for what we thought would be a quick obligatory visit to the Clown Hall of Fame. Victoria and I wouldn’t consider ourselves clown fanatics but we soon found out the average human (us) has been influenced or at least experience a great deal of clown culture. We entered a small, shared community mall whose only cheerfulness came from the painted sign for the Clown Hall of Fame. 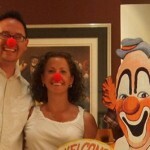 We walked through the door and were greeted by Greg DeSanto, professional clown. We handed Greg our $10 admission ($5 each) and were surprised when he offered and proceeded to take us on one of the most in-depth and enjoyable tours we taken so far on our trip (at least a tour that didn’t include free beer (see Anheuser Busch Brewmaster tour). The entryway of the Hall of Fame contains what Greg referred to as the “art of the clowning;” a collection of clown artwork featuring a number of familiar faces and artists. He then led us in to the one large, fluorescently-lit back room that serves as the official Hall of Fame; and provided us with overviews and interesting insights into the collectibles and life stories of some of the world’s most famous clowns. Clown culture is inescapable in America, as the most famous clown in America has been serving our children Happy Meals for almost 50 years. Ronald McDonald is recognized by 96% of all American elementary school students. 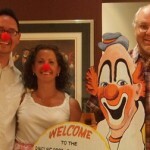 In fact, I was surprised by how many clowns I recognized while looking over the exhibits. Bozo and Cooky from WGN’s The Bozo Show. Red Skelton. Emmett Kelley. Bobo the Clown. The list goes on and on and the impact these clowns had on later television and film actors is immense. Many early variety shows and even recent comedians like Jim Carrey, despite not donning the makeup owe a great deal to the likes of these clowns and their innovations. The displays were well-organized and eye-catching, but what really made the tour special was DeSanto’s obvious passion and amazing personal insight into a career and culture he loves. Yep, that's Greg the Clown... on a Stamp! Greg has spent 27 years as a circus clown, he and his wife are a well-known clown team and was one of only two clowns to appear on a US postage stamp. He road the rails with Ringling Brothers, was a featured clown with his hometown Big Apple Circus and in Baraboo’s Circus World and even served as Ringling Brothers Director of Clowning at their prestigious Clown College (which, by the way, I’m going to insist be my next title), and now serves as Executive Director for the Clown Hall of Fame. We’re talking clown royalty here, people! Greg was very patient with us, spending nearly an hour sharing some anecdotes and answering our questions. Just a really great guy, and apparently, quite a clown! One of the best things about having a place to share these great stories and memories of clowns past, present & future is the opportunity to meet such equally interesting people like Kimmer & Victoria. I was fascinated by their story and how they are taking the time out of very busy lives to focus on this grand adventure of the next 52 weeks. As someone who’s been blessed to have the opportunity to travel, this trip will forever change them, create the most wonderful stories and enrich the lives of everyone they meet. Aww shucks Greg! Thanks for the kind words, we had SOOO much fun, and learned so much. Greg is a class act. And yes; Clowning is an art that has a steep history (as it, along with music, painting and dance, predates history). As you point out about examples like Jim Carrey, it is still evolving. The story of the Clown is part of the story of humanity. Clowning is RELEVANT! THis is such a great example of two unrelated entities meeting and truly enjoying and being changed by the experience. Your site rocks, I am still amazed at your guy’s vision, commitment to it and courage… and, of course, jealous as hell! When is the Michigan part of your trip – still interesting in meeting up with you guys if it works out. I’m actually working for MT today, and Victoria is putting together a more finalized timeline. We’ve had a few hiccups – destroyed my oil pan on my car, popped a tire – so we’re a little behind. But I’ll let you know tomorrow or monday for sure! These guys study for years for this. How funny is that? I sent my office a bouquet that should be delivered this week. haha! Howdy from the road to both Greg and Karen. Wow, I’m 6’1 and 230… alright, 245 and can’t IMAGINE squeezing in there Toto! Amazing trick, loved to have seen that live!